Welcome to the Smart Cities Challenge! A month-long series of events leading up to a hackathon on Saturday, February 21st. Congratulations and thank you to everyone who helped make the Smart Cities Challenge a success! 75 participants formed teams--and in under 8 hours designed and developed some creative and high-impact solutions. Check out the winning projects below! What will I do at the hackathon? You'll work with a team to rapidly design solutions for challenges presented by two local cities. At the end of the day, teams will present their solutions to a panel of city representatives and other experts ready to implement the best ideas. You could create an innovative hardware application, a new business model, or a policy intervention! Do I need to be a technology expert? No! While we welcome participants who can code, we need people with diverse backgrounds – especially public policy, business, urban planning, community organizing, design, or journalism. 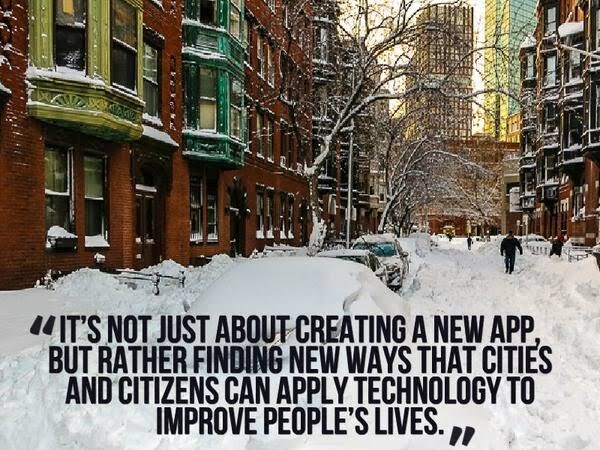 City of Holyoke: Using Internet of Things (IoT), civic tech, and other smart cities concepts, how can the City of Holyoke improve the pedestrian experience for residents and visitors? City of Somerville: How can the City of Somerville crowdsource useful data from community stakeholders to better understand and address complex policy challenges? For the full challenge statements and background materials, see here. What will happen to the winning projects? Winners will receive prizes including mentoring to continue work on their ideas. Two winning teams also will go on to compete globally against contestants from the 20+ cities around the world participating in the Global Urban Datafest. Learn the basics of Design Thinking through a hands-on, practical workshop that will take participants all the way from problem formation to prototype design. RSVP on Facebook here. Come learn how to quickly prototype and test hypotheses without writing a single line of code. We'll be exploring some of the tools covered here. February 21 - Smart Cities Challenge Day!! See schedule details on right. Use IBM Bluemix for your Hacks! Click here to Learn!